Zucchini is the gift that keeps on giving, sometimes so much so we are unsure of what to do with it come the abundant harvesting season. A few ideas once we approach the season of local goodness are pickling, pasta noodles, bread, sautéed, grilled, sandwich stackers and salsa. 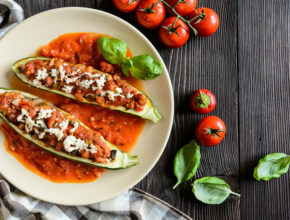 For a more hearty and fulfilling approach to keep us sustained through this chilly week, I chose a delicious stuffed zucchini packed with veggies and protein. Cut each zucchini in half lengthwise. Scoop out seeds and pulp, leaving a 1/4-in. shell and set aside. Chop pulp and set aside. In a large skillet, cook sausage and onion over medium heat until meat is no longer pink; drain. Add garlic and zucchini pulp; saute for 3-5 minutes or until pulp is tender. Remove from the heat. Stir in the bread crumbs, 1/2 cup Parmesan cheese, basil and egg. Sprinkle salt inside zucchini shells. Fill each with 3 tablespoons meat mixture. Sprinkle with remaining Parmesan cheese. Pour half of the jar of tomato sauce in a 9×13 pan. Place zucchini on top of sauce. Cover and bake at 350° for 15 minutes. Uncover; bake 15 minutes longer or until zucchini is tender and filling is heated through. While baking in a small saucepan heat the remaining tomato sauce. 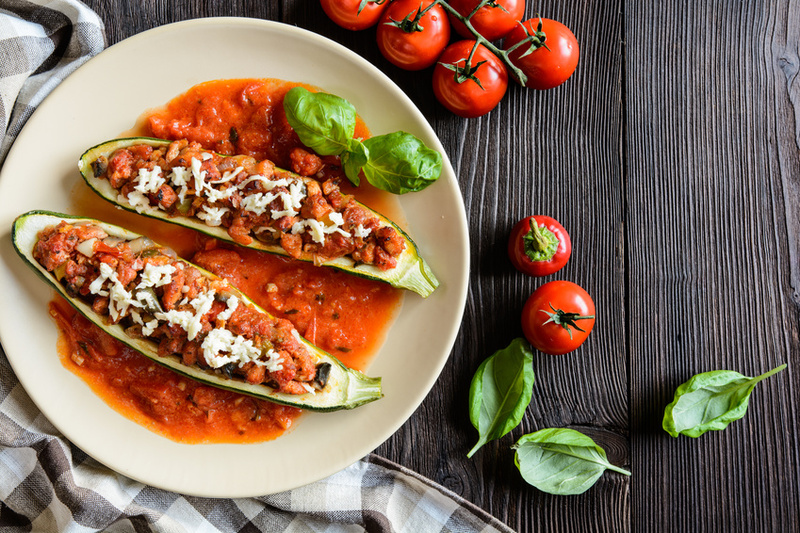 Once you have plated your zucchini boats, top with marinara, parmesan cheese and fresh basil.